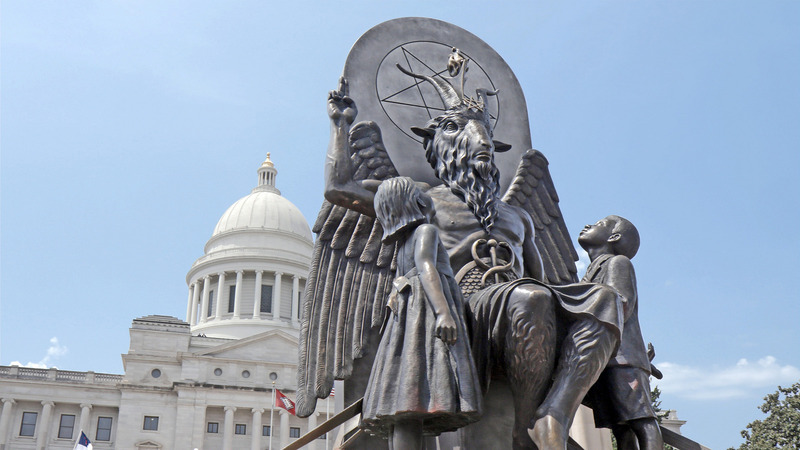 “Hail Satan?” is a documentary about the rise of the modern-day Satanic Temple. Walking into the film, I was expecting to be horrified by the antics of the group, but instead I found myself rather enjoying, and sometimes even laughing, at them. These modern-day Satanists are nothing like the scary stories we’ve all heard about as kids. Spending a surprisingly non-existent amount of time sacrificing goats, the group instead pushes for secularism in the United States and for the separation of church and state. The Satanic Temple’s goals fall more in line with a political movement than any sort of pre-existing religion. It’s not that I necessarily support the Satanic Temple in all that they do, but I do see the rationale behind their actions. The group certainly isn’t out to spread famine and pestilence across the country. In fact, the group is heavily involved in charitable causes in several states. Pastafarianism: Followers of this homegrown U.S. religion believe in the “Flying Spaghetti Monster” and promote a more lighthearted view on religion. They act similarly to the Satanic Temple in how they often “troll” overly religious members of other beliefs. Our Lady of Perpetual Exemption: Created by comedian and television host John Oliver to mock religious organizations and “televangelists” who profit off the faith of their followers. It also acts to make a statement about the tax-exempt status of many religious organizations who control vast amounts of wealth. Westboro Baptist Church: Formed in the 1950s in Kansas, the WBC is famous for its hate speech against the LGBTQ community, Jews, Muslims, Atheists, Catholics, American soldiers and politicians, and seemingly anyone who isn’t them. They are labeled as a hate group by numerous organizations. Modern-day Satanists are trolls of epic proportions. They rely on shock factor and stereotypes to make a fool of those who would disagree with them. Acts of goodwill are carried out while wearing leather and spikes to confuse those who might cast judgment on a person’s looks alone. This falls in line with the Temple’s efforts to force people to judge on actions rather than appearances. “Hail Satan?” is to the political left what “God’s Not Dead” was to the right. For the most part, I believe it will be entirely dismissed as a joke by many conservatives. Those farther to the left might see it as ammunition for debates on the separation of church and state. As someone who leans more liberal, I enjoyed it, but I can see it angering many on the other side as the film often paints faithful Christians as gullible fools. This is a film made with a specific target audience in mind — it’s not for everyone. In the same way that Fox News and CNN have specific audiences, so does “Hail Satan?”. The film doesn’t make up facts or paint false narratives, but it does do a remarkable job at reconfirming existing personal biases. This is a film that strengthens opinions on religion, it doesn’t change them. “Hail Satan?” gives a clear and accurate description of modern-day Satanism. It doesn’t make anything up, but it does tend to play religious Americans as foolish. How you think you’ll feel about the movie before seeing it is likely how you’ll feel after seeing it. “Hail Satan?” is a well-made and informative documentary that is entertaining from many different angles. It is not, however, so revolutionary that I would see it changing minds and opinions on something as important as religion and faith.